John Budicin received his art education from noted artists Ray Vinella, Michael Lynch, Len Chmiel and Sergei Bongart. His paintings have achieved numerous top awards from esteemed art competitions, including first place at the California Art Club’s 87th Annual Gold Medal Juried Exhibition. In 2002, the renowned California Club in Los Angeles selected one of his paintings for its permanent collection. Budicin has been featured in several articles published by national magazines, including Southwest Art, Art of the West, American Artist and International Artist. His paintings are also featured in the book 200 Great Painting Ideas for Artists. He teaches several workshops each year in such places as the Scottsdale Artists’ School in Arizona; Fredericksburg Artists School in Texas; Fechin Art Institute in New Mexico; and the Plein Air Painters of America’s workshops in Vermont. 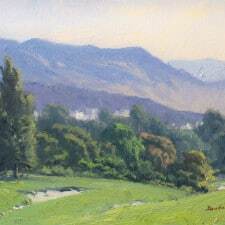 In 1999, he conducted the first overseas workshop in Tuscany and Umbria, Italy sponsored by the California Art Academy and Museum, an affiliate of the California Art Club. 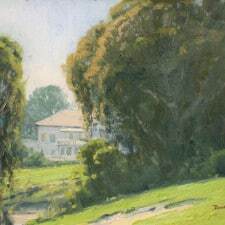 John Budicin is a Signature Member and past president of Plein Air Painters of America, as well as a Signature Member of Oil Painters of America, and Laguna Plein Air Painters Association. 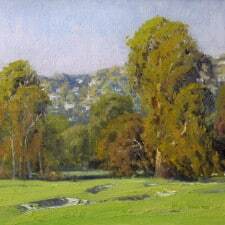 He is a Signature Artist Member of the California Art Club.